Introduction to Lipid Biochemistry from C.H.I.P.S. 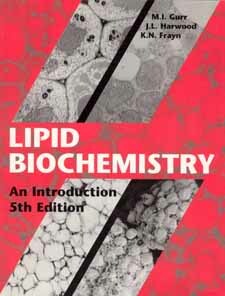 Since the publication of the first edition of this successful and popular book in 1970, the subject of lipid biochemistry has evolved greatly and this fifth up-to-date and comprehensive edition includes much new and exciting information. Lipid Biochemistry, Fifth Edition has been largely re-written in a user-friendly way, with chapters containing special interest topic boxes, summary points and lists of suggested reading, further enhancing the accessibillity and readability of this excellent text and training tool. It provides a most comprehensive treatment of the subject, making it essential reading for all those working with or studying lipids. Upper level students of biochemistry, biology, clinical subjects, nutrition and food science will find the contents of this book invaluable as a study aid, as will postgraduates specializing in the topics covered in the book. Professionals working in research in academia and industry, including personnel involved in food and nutrition research, new product formulation, special diet formulation (including nutraceuticals and functional foods) and other clinical aspects will find a vast wealth of information within the book's pages.